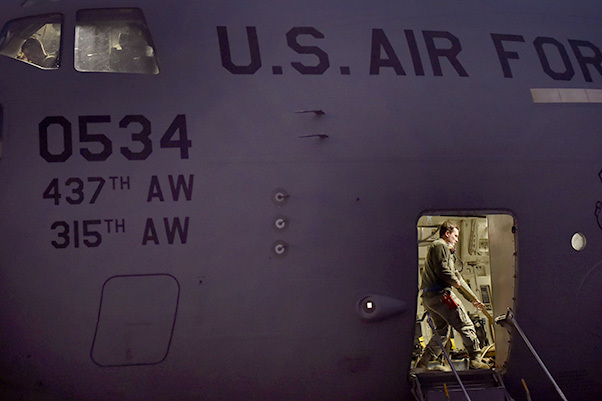 Airman 1st Class Kevin Schreiber, 437th Aircraft Maintenance Squadron crew chief, marshals a C-17 Globemaster during a Joint Forcible Entry training event in support of the U.S. Air Force Weapons School Integration phase here, Dec. 9. Thirty seven C-17s, 21 C-130 Hercules and 120 U.S. Army paratroopers participated in the mobility portion of the WSINT phase during a simulated mass JFE event over a contested target on a range near Nellis Air Force Base, Nev. The event is designed to teach Airmen how to get safely to their target and direct airpower and follow-on forces to that target. The 437th Airlift Wing at Charleston Air Force Base, S.C., launched 17 C-17 Globemaster IIIs in support of the largest U.S. Air Force Weapons School Integration Phase Joint Forcible Entry event in its history, Dec. 9, 2017. 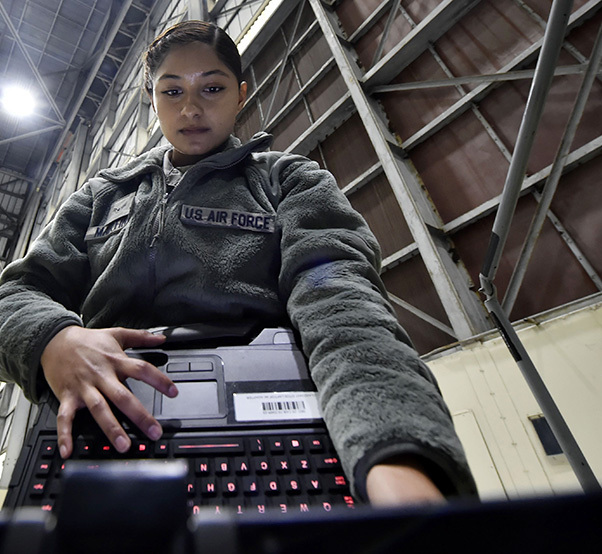 The U.S. Air Force Weapons School at Nellis Air Force Base, Nev,, trains tactical experts and leaders to control and exploit air, space and cyberspace on behalf of the joint force. Aircrew members here participated in the JFE, allowing for the chance to integrate with more than 100 dissimilar aircraft. 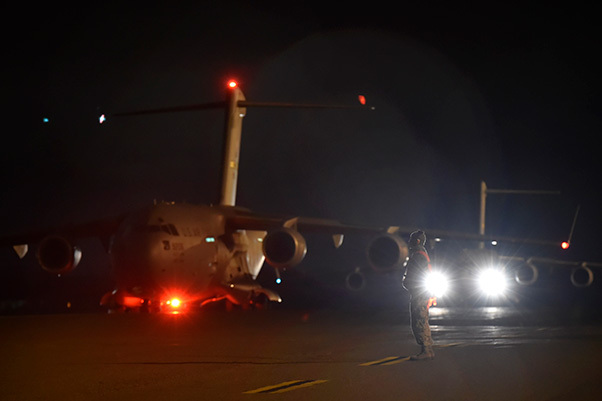 Mobility Air Forces aircraft, launching from 12 bases, participated in the capstone event, with an objective to deliver 120 U.S. Army paratroopers to a target area. Staff Sgt. 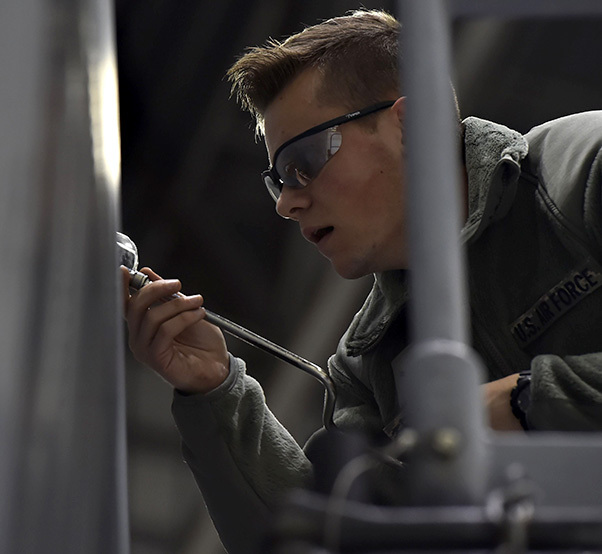 Tyler Switzer, 437th Aircraft Maintenance Squadron aerospace maintenance craftsman, prepares a C-17 Globemaster III for a Joint Forcible Entry training event in support of the U.S. Air Force Weapons School Integration phase here, Dec. 9. 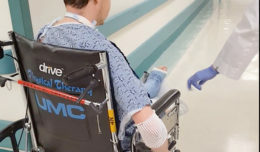 The scale of the event provided a realistic training experience. Sallenger said the size and realism of the JFE is necessary to prepare aircrew members for real world operations. Although the MAF completed the phase effectively, support elements ensured success. Sallenger said the accomplishment of events like these start at the ground level. Airman 1st Class Nicolas Rainey, 437th Aircraft Maintenance Squadron aerospace maintenance technician, performs ground maintenance on a C-17 Globemaster III in preparation for a Joint Forcible Entry training event in support of the U.S. Air Force Weapons School Integration phase Dec. 8. Thirty seven C-17s, 21 C-130 Hercules and 120 U.S. Army paratroopers participated in the mobility portion of the WSINT phase during a simulated mass JFE event over a contested target Dec. 9, on a range near Nellis Air Force Base, Nev. The event demonstrates the U.S. Air Force’s ability to execute rapid, decisive responses to crises worldwide. Master Sgt. 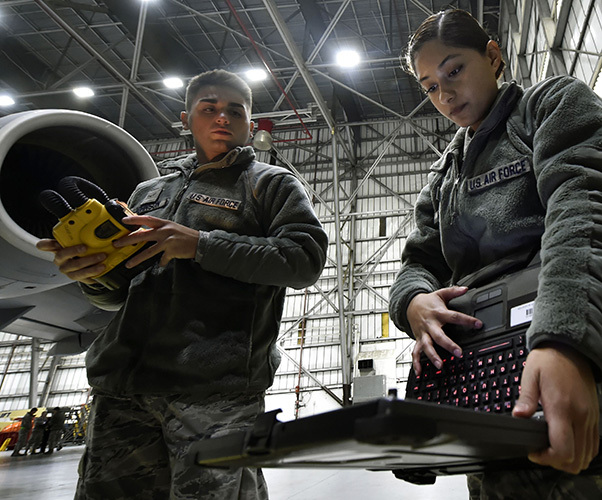 David Sutter, 437th Aircraft Maintenance Squadron gold production pro superintendent, said that the 437th AMXS executes their mission the same whether an event is training or real world. Every six months, the Weapons School graduates approximately 100 Weapons Officers and enlisted specialists who are tactical system experts, weapons instructors and leaders of Airmen. Joint Base Charleston, as part of the MAF, demonstrated an ability to integrate with the CAF and joint partners during the JFE event and helped build a realistic experience for the future Weapons Officers involved. Capt. 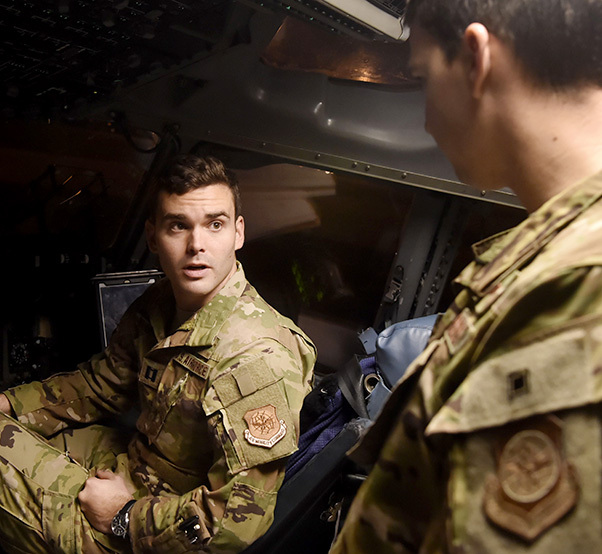 Matthew Anthony, 15th Airlift Squadron C-17 Globemaster pilot, performs preflight checks in preparation for a Joint Forcible Entry syllabus event in support of the U.S. Air Force Weapons School Integration phase here, Dec. 9. 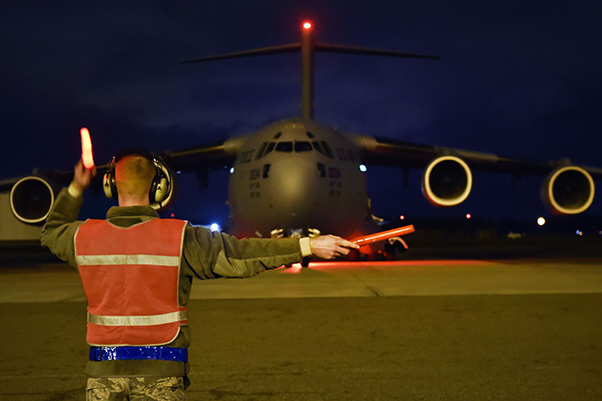 Airman 1st Class Kevin Schreiber, 437th Aircraft Maintenance Squadron crew chief, prepares to marshal a C-17 Globemaster during a Joint Forcible Entry training event in support of the U.S. Air Force Weapons School Integration phase here, Dec. 9. 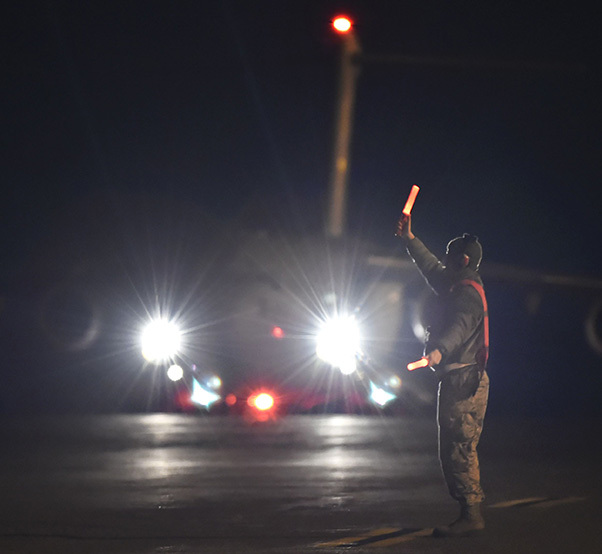 Airman 1st Class Logan Mueller, 437th Aircraft Maintenance Squadron crew chief, marshals a C-17 Globemaster III during a Joint Forcible Entry training event in support of the U.S. Air Force Weapons School Integration phase here, Dec. 9. Staff Sgt. Erin Winkler, left, and Tech Sgt. 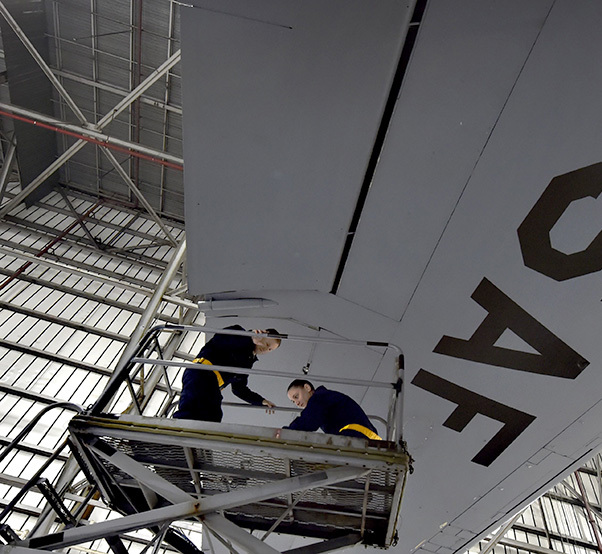 Chris Kalif , right, both 437th Aircraft Maintenance Squadron aerospace maintenance craftsmen, perform ground maintenance on a C-17 Globemaster III in preparation for a Joint Forcible Entry training event in support of the U.S. Air Force Weapons School Integration phase Dec. 8. Thirty-seven C-17s, 21 C-130 Hercules and 120 U.S. Army paratroopers participated in the mobility portion of the WSINT phase during a simulated mass JFE event over a contested target Dec. 9, on a range near Nellis Air Force Base, Nev. The event demonstrates the U.S. Air Force’s ability to execute rapid, decisive responses to crises worldwide. Tech Sgt. 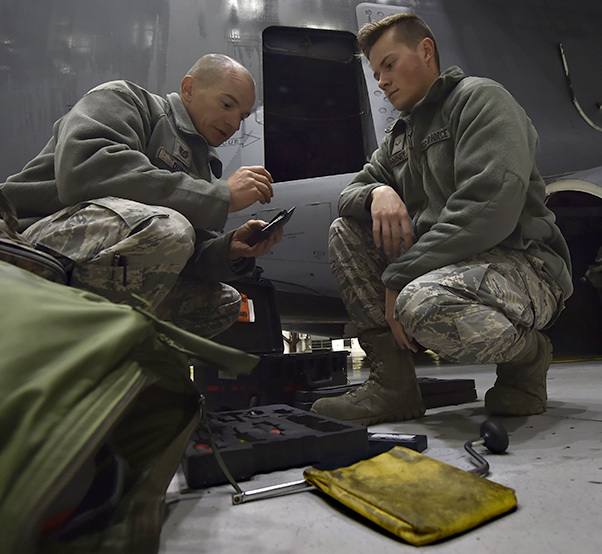 Brian Duell, left, 437th Aircraft Maintenance Squadron aerospace maintenance craftsman, and Airman 1st Class Nicolas Rainey, right, 437th AMXS aerospace maintenance technician, perform ground maintenance on a C-17 Globemaster III in preparation for a Joint Forcible Entry training event in support of the U.S. Air Force Weapons School Integration phase Dec. 8. Airman 1st Class Yasuary Martinez, 437th Aircraft Maintenance Squadron aerospace maintenance journeyman, performs ground maintenance on a C-17 Globemaster III in preparation for a Joint Forcible Entry training event in support of the U.S. Air Force Weapons School Integration phase Dec. 8. Airman 1st Class Richard Johnson, left, and Airman 1st Class Yasuary Martinez, both 437th Aircraft Maintenance Squadron aerospace maintenance journeymen, perform ground maintenance on a C-17 Globemaster III in preparation for a Joint Forcible Entry training event in support of the U.S. Air Force Weapons School Integration phase Dec. 8. 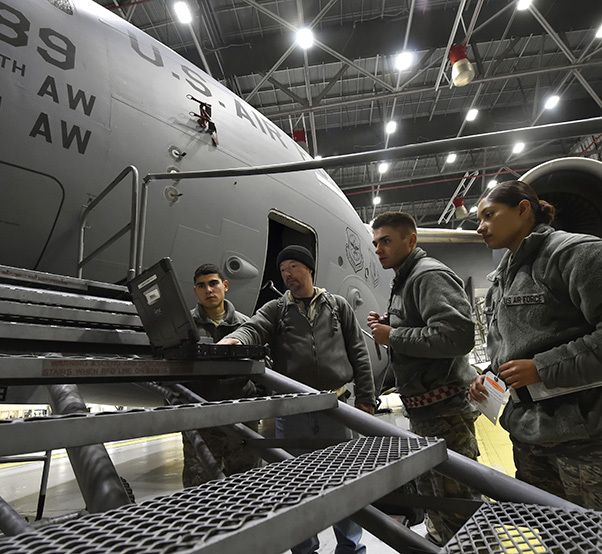 Members of the 437th Aircraft Maintenance Squadron perform ground maintenance on a C-17 Globemaster III in preparation for a Joint Forcible Entry training event in support of the U.S. Air Force Weapons School Integration phase Dec. 8. Tech Sgt. Chris Kalif, left, and Staff Sgt. 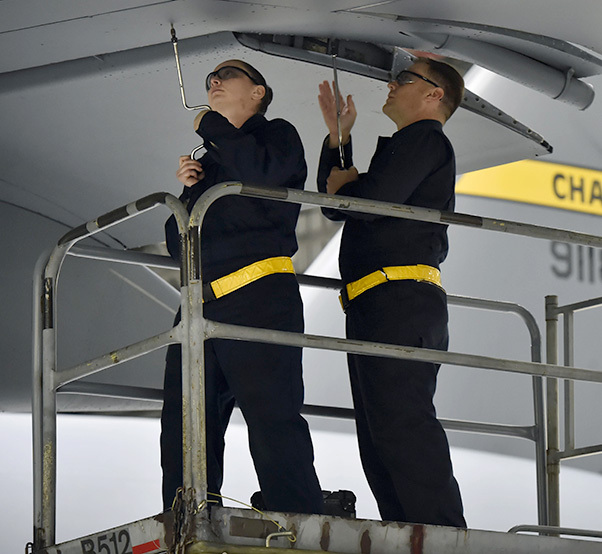 Erin Winkler, right, both 437th Aircraft Maintenance Squadron aerospace maintenance craftsmen, perform ground maintenance on a C-17 Globemaster III in preparation for a Joint Forcible Entry training event in support of the U.S. Air Force Weapons School Integration phase Dec. 8.